The following is from the Federal Writers' Project of the Works Progress Administration, 1937-38 Series, Bulletin 17. In the 1820's, when the new country was expanding and beginning to develop its natural resources, there was great enthusiasm for artificial waterways to transport heavy goods, such as coal and iron, from the isolated interior to the growing manufacturing centers along the Atlantic seaboard. Railroads were still a vision. There were vast stretches of country rich in iron and coal that were forced to depend for transportation of the slow-moving horse or mule-drawn wagons traveling the often impassable roads. One day in 1822, a Morristown man named George P. McCulloch was fishing at Great Pond, or Lake Hopatcong as it is now called. 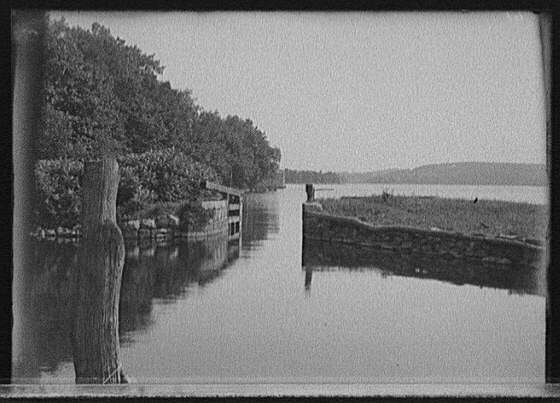 It occurred to him that the amount of water spilling out of that lake would be enough to maintain a canal running from Hopatcong east to Newark and west to the Delaware. At that time coal from the mines in the vicinity of Easton, Pa., had to be transported to eastern cities by the long water route down the Delaware and up the New Jersey coast, or by wagons which could haul only a ton. Fox Hill, between Denville and Parsippany, was a grade of almost 30 percent. It took powerful horses and oxen to haul even a small load over the hill. Following the discovery of iron ore all over Morris County, forges had sprung up even before the Revolution. In a single stretch of the proposed canal between Rockaway and Andover, a distance of 15 miles, there were 56 forges, most of which had been forced to shut down because they had practically exhausted the local supply of wood fuel. Large shipments of coal through the canal would mean the rebirth of this industry. McCulloch's idea gained in popularity and a bill was introduced in the 1824 session of the New Jersey Legislature in an attempt to obtain State funds for building the canal. The legislature did nothing about it. The canal backers, however, got a charter authorizing them to build a canal with private funds, if the money could be raised. Under the name of the Morris Canal and Banking Company the corporation was launched in a spirit of speculative enthusiasm. The charter was so liberal that it even permitted the company to issue its own currency. Years later the company was forced into bankruptcy as a result of the privileges which seemed so desirable when it began. The original charter provided for a capital stock of $2,500,000. The right to condemn land for canal purposes was granted. The State retained the right to take over the canal at a fair valuation after 99 years or to extend the charter 50 years, after which ownership would pass to the State without payment. Another provision granted the heirs of the original owners the right to repossess the land that they had given or sold in case the canal was abandoned. Some of the land was given outright. Some was bought for the nominal sum of 6 cents an acre, and some was seized without due process of law. 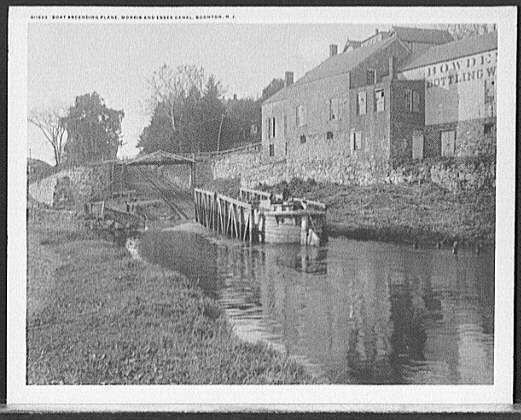 Interest in the Morris Canal and great expectations for its money-making possibilities were stimulated by the success of the Erie Canal in New York, completed in 1825. But the New Jersey route offered serious obstacles for the engineers. In order to traverse the 55 miles from the Hudson to the Delaware the canal would have to wind for almost twice that distance through the hills, climb to a height of 1,000 feet and descend more than 700 feet over the hump-backed ridge of New Jersey. The only solution was the building of planes or inclined tracks, connecting one level of water with another. A boat was floated onto a cradle that ran under the water on tracks. When the boat had settled securely on the cradle, both were dragged uphill by chains wound on drums. Power was supplied by the overflow of water from the upper to the lower levels. When the cradle reached the top it was run into a lock; water was admitted, and the boat floated off the cradle again. From there the boat proceeded by mule power to the next plane where the operation was repeated. in this way the boats were literally carried over the mountains. For gentler changes in elevation, ordinary locks were used without planes. 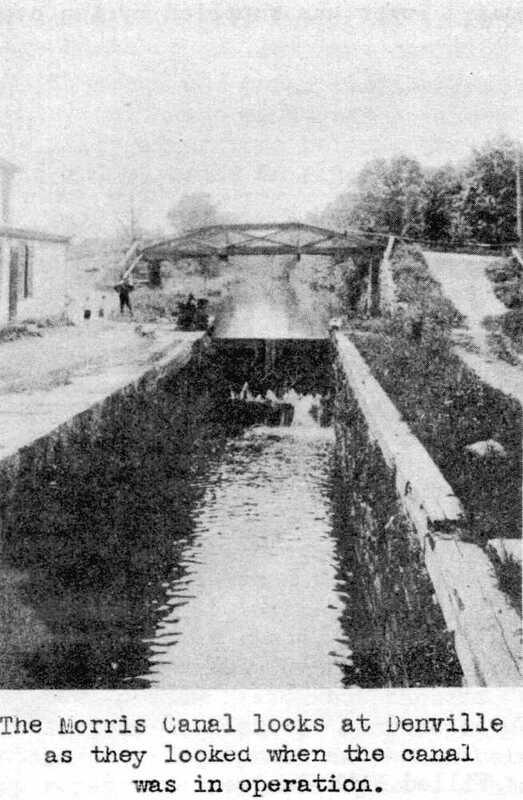 When the canal was completed it had 23 planes and 23 locks. 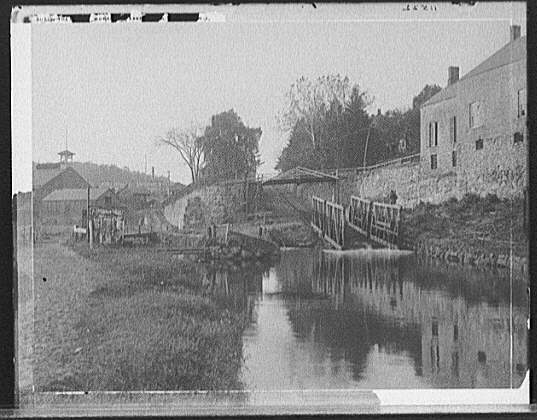 Construction of the Morris Canal began in 1825, soon after the first money had been raised. Six years later the waterway was opened to traffic between Newark and Phillipsburg. Hand labor was the backbone of the construction job. Concrete, as used today, was unknown. All masonry had to be of stone construction, held together by lime mortar. There were no compressed air drills or dynamite, no steam shovels or motor trucks, no iron girders or "I" beams. A working day was from sunrise to sunset. The wages were 90 cents a day or even less. Rocks were blasted by drilling holes with hand drills and then filling the holes with black powder. After tamping them with clay and dropping a glowing coal on the clay, the blaster ran for cover before the flying rock crushed him. Practically every foot of earth and stone which formed the canal excavation was removed by hand. Even wheelbarrows were scarce. Horses and oxen were needed for farm work and were grudgingly lent or leased for canal construction. The organizers of the canal company, more interested in the project as a stock-selling proposition than as a useful enterprise, were shortsighted in making their plans. The canal was built only 52 feet wide at the top, 20 feet wide at the bottom and 4 feet deep. Compared with the other canals of that day, it was far too small. 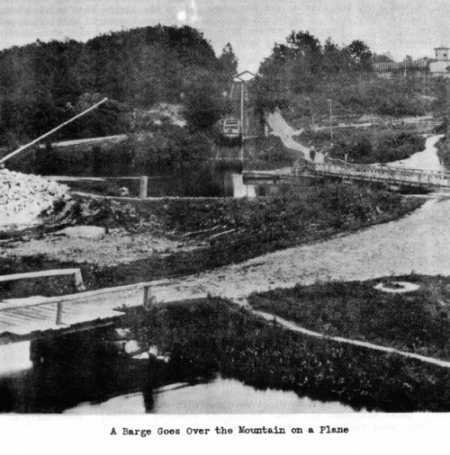 The 70 ton barges in use on the Lehigh Canal in Pennsylvania were too large for the new canal. This meant that the coal, instead of being carried direct from the mines in Pennsylvania, had to be transferred from the large boats to smaller ones carrying only 25 tons. Although the canal was designed primarily for commerce, people were so delighted with the picturesque waterway that a packet boat drawn by three horses made daily excursions between Newark and Paterson. Fares were 25 cents to Bloomfield and 50 cents to Paterson. This was a favorite holiday trip for Newarkers. From Phillipsburg on the Delaware, opposite Easton, Pa., the canal ascended Hopatcong Mountain, came down again and idled past Port Murray, Rockport and Hackettstown. Passing Saxton Falls, it edged along Sussex County at Waterloo and Stanhope and then touched Lake Hopatcong, its water source, and came into Morris County. Here it made a snakelike way to the east, passing Morris Landing, Kenvil, Wharton, Dover, Rockaway, Boonton, Towaco, Mountain View. At Little Falls, it crossed Passaic River in a wooden aqueduct, finally turning southward through Belleville and Newark to Newark Bay. The inclined planes, which had delighted visiting legislators and other observers when they were first tested, sometimes provided unexpected thrills. Upon one occasion a car carrying the barge Electa was beginning the descent of the Boonton plane when the sprocket chain broke. Laden with iron, the boat tore down the track at terrific speed, striking the water at the bottom with such force that it was ricocheted over a 20-foot embankment into a clump of trees. The captain's wife, extricating herself from the branches, "allowed" she had come down pretty fast, but thought "that was the way the thing worked." After more serious accidents, hemp ropes were substituted for chains and damage to boats, canal equipment and human beings was somewhat reduced. Eventually the hemp ropes were replaced by wire cables. Although it was foredoomed to financial failure and decay, the new waterway brought prosperity to the adjoining country during its comparatively brief existence. Before the barges came with coal from the Pennsylvania mines, Boonton was a village with grass-grown streets. It sprang into life with a blast furnace, four forges and a mill for manufacturing iron sheets. The machinery and expert workers were brought from England and soon 200 people were employed by the East Jersey Iron Manufacturing Company. Forges and iron works flourished throughout the northern part of the State. Little towns such as Port Murray, Port Colden, Pequannock, Pompton and Rockaway were developed. The canal proved an industrial godsend to Newark, where factories eagerly awaited cheap coal. The city doubled its population between 1830 and 1835. In 1836 there was a wave of national prosperity; Morris Canal stock which had sold at 32 in 1834 rose to 188 in a year. The directors purchased $6,000,000 worth of improvement bonds of Indiana and Michigan, then young and struggling States. After selling these to the public, some of the money was used to extend the Morris Canal to Jersey City, but most of it was dissipated. Then the canal was mortgaged for nearly $1,000,000 but the stockholders' interests were not protected. The company went bankrupt and thousands of investors lost everything. Out of the proceedings, however, came a reorganized canal company. In 1844 the canal was enlarged, enabling the heavier Lehigh boats to come directly from the mines through the Lehigh Canal, across the Delaware and through the Morris Canal. These were made in two sections hinged together, to enable them to pass up and over the steep inclines of the planes. From then on the canal began to prosper. At the peak of its prosperity in 1866 there were as many as 1,200 boats in operation, an average of 12 boats per mile. But the reorganization came too late. Whereas the usual time for the trip between Phillipsburg and Jersey City was 5 days, railroads were now able to haul coal between the two points in 8 hours. Each car, carrying almost as much as a canal boat, continued to draw tighter and tighter the noose that was slowly but surely choking life from the canal. Besides the railroad competition, which alone was enough to kill the canal traffic, there were other forces at work. The canal basin in Jersey City had become enormously valuable for other purposes. The Lehigh Valley Railroad, which had leased the canal in 1871, had found it a burden to carry. 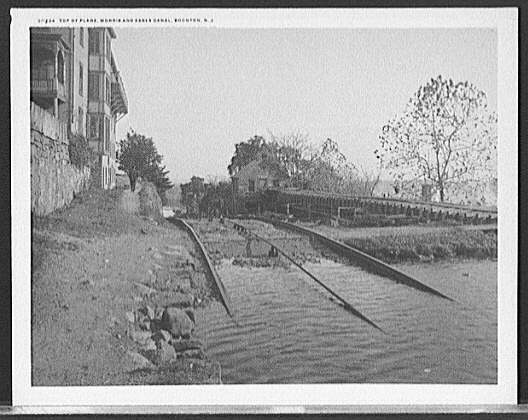 The revenue was not sufficient to pay for the upkeep, but under the terms of the lease, the railroad company was obliged to keep the canal navigable. When traffic had dwindled to little or nothing the company demanded that the State take over the property. This was in 1903. Finally no craft were seen along the quiet waterway except a few canoes or motor boats on pleasure voyages to and from Lake Hopatcong. Probably the most insistent demand for abandonment came from Hudson Maxim, one of the inventors of smokeless powder, who owned many hundreds of acres at Lake Hopatcong, the primary source of water for the canal. Under the charter the canal company had been permitted to construct a 6-foot dam to hold the water of the lake in time of flood and heavy rainfall, thus ensuring a sufficient supply for operation in abnormally dry seasons. As a result the surface area of the lake, already the largest in New Jersey, was more than doubled in size. But if, as permitted by law, this 6-foot supply was drawn off, parts of Lake Hopatcong would be a mudflat, reeking with decaying vegetation. While it was conceded that the canal was worthless for transportation and that in the cities the sluggish waters were a menace to health, there were many who fought strenuously to preserve its rural sections as beauty spots. The Morris Canal Parkway Association was formed to champion the cause of the derelict. It was not concerned with the sections of the canal that ran through cities. The members were willing to compromise with Maxim and guarantee that only the overflow waters of Lake Hopatcong would be used. They pointed out that with the discontinuance of canal boat traffic the enormous amount of water needed to work the locks and planes would be saved. But the State Assemblymen, in whose hands the fate of the canal rested in 1924, thought otherwise. During the countless hearings that took place, they heard the old canal referred to as "an open sewer" and "a man-made octopus sapping northern New Jersey of its water." And so it was that the old Morris Canal, doomed from its birth, was finally abandoned officially. The canal is now dead, a ditch dried, its towpaths overgrown with brush and weeds, its locks, planes and bridges obliterated. Only here and there remain shallow stretches of stagnant water. There are many who remember it in its day of good service when the panting mules tugged and pulled the clumsy barges, when man and beast rested while a spinning water wheel dragged the boat and cargo uphill to the next level, when the air resounded with shouts and cracking whips. Mules were driven not by lines but by shouted commands. "Gee" meant go to the right, "Haw," left. Those words were and are still used in driving oxen. But another, doubtless of French origin, "petitwhoa," meant, in mule, not to "whoa" at all but to "dig in our toes." This was used when a boat loaded with 70 tons of coal or ore had to be started out of a lock. A too sudden surge or yank would break the towline. This would have meant an outburst of profanity and possibly a beating up with the huge blacksnake whips that the drivers always carried. So the mules soon learned that "petitwhoa" meant just that"whoa, a little." When an old mule had outlived his usefulness, he went to his reward. He was led to the nearest canal mule cemetery, knocked over the head with the dull end of an axe and buried in a shallow grave. One of these canal-mule burying grounds is a part of the seventh hole of Rockaway River Golf Course at Denville. Canal boats had to be steered, otherwise they would run "spang" into the bank as the mules towed them along. The boatman, usually the captain, did the steering while his hand drove the mules. The "canaller's" life was a sort of gypsy, vagabond existence, out in the open with little hard work. When it once got into a man's blood it stayed with him. There are many cases where canalling was the chosen occupation of entire families through generations. The number of people who sometimes lived in a small boat cabin was almost unbelievable. There were no toilet accommodations of any kind. Bathing was done with a tin basin on deck. When washday came the clothes were strung from the towline posts. Aside from the boatmen, the workmen were mostly lock tenders, plane tenders and towpath walkers. The last were just what the name implies. They walked the towpaths, covering a beat of from 6 to 10 miles, on a sharp lookout for possible leaks which might flood an entire area. The chief enemies of the towpath walker were muskrats who burrowed into the banks to make their nests. A colony would almost honeycomb a bank in a few days if not prevented. In Newark there are several living reminders of the waterway. Plane Street is the site of one of the planes on the canal. On Orange Street, just below First Street, is one of the old drums used to pull the boats up the rise and over Orange Street. The Newark subway is built on the old canal bed where it ran under Broad Street between the old Post Office and Kresge's Department Store and under the old Center Market, as far as Mulberry Street. Here the boatmen were forced to pole the barges through the dark damp tunnel, ill-smelling and alive with rats. Near Waterloo, in Sussex County, there is a small section preserved by the State, the only part of the 109 miles that is still in use. or do a search on "Morris Canal"
Copyright �1999-2017 by Brianne Kelly-Bly, all rights reserved.